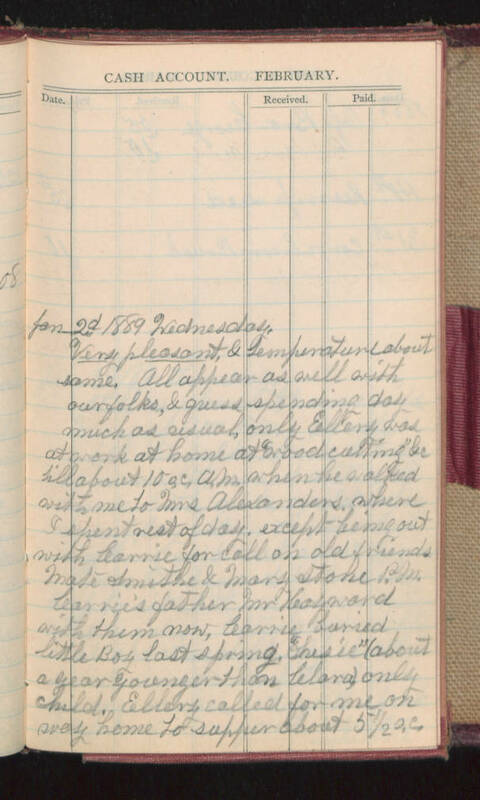 Jan 2d 1889 Wednesday Very pleasant & temperature about same. All appear as well with our folks, & guess spending day much as usual, only Ellery was at work at home at woodcutting be Will about 10 o.c. AM when he walked with me to Mrs Alexanders where I spent rest of day except be me out with Carrie for call on old friend. Made Smithe and Mary Stone P.M. Carrie's father Mr. Hayward with them now, Carrie buried little boy last spring, [illegible] (about a year younger than Lelora) only child. Ellers called for me on way home to supper about 5 1/2 o.c.